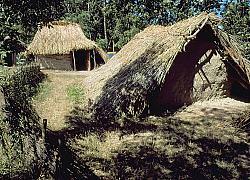 kilometre east of the municipality, above the right bank of the Ohře River, there are the grounds of an open-air museum comprising reconstructed primeval and Early-medieval constructions. In contrast to other open-air museums of Europe, there are settlement objects built approximately on ground-plans discovered with a search of this archeological locality by Dr. Ivana Pleinerová. The oldest reconstructed object was originally built in Early-Stone-Age period. March - April DI - SO 09:00 a.m. - 04:00 p.m.
May - September DI - SO 09:00 a.m. - 05:00 p.m.
October - December DI - SO 09:00 a.m. - 04:00 p.m.